Here we are going to see solution of first question of area of triangle worksheet. Find the area of triangle whose vertices are (1,1) (3,4) and (5,-2). Therefore the area of ABC = 9 square units. Find the area of triangle whose vertices are (6,7) (2,-9) and (-4,1). Find the area of triangle whose vertices are (3,4) (2,-1) and (4,-6). Find the area of triangle whose vertices are (5,6) (2,4) and (1,-3). Find the area of triangle whose vertices are (1,3) (-7,6) and (5,-1). Find the area of triangle whose vertices are (-3,-9) (-1,6) and (3,9). Find the area of triangle whose vertices are (-3,-9) (3,9) and (5,-8). Find the area of triangle whose vertices are (4,5) (4,2) and (-2,2). Find the area of triangle whose vertices are (3,1) (2,2) and (2,0). 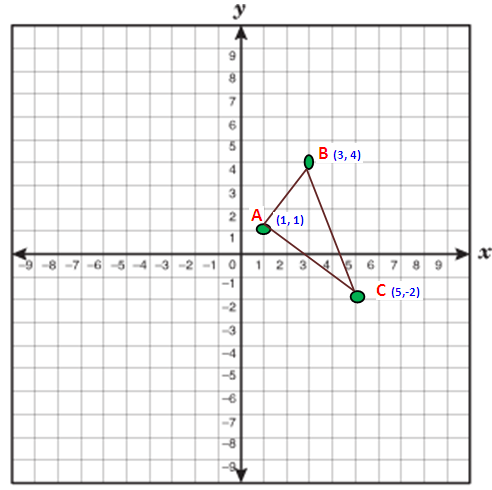 Find the area of triangle whose vertices are (3,1) (0,4) and (-3,1). After having gone through the stuff given above, we hope that the students would have understood "Area of triangle question5"
Apart from the stuff given above, if you want to know more about "Area of triangle question5", please click here.